Stalwarts come together to harness the power of the Indian-American community. Aziz Haniffa reports. 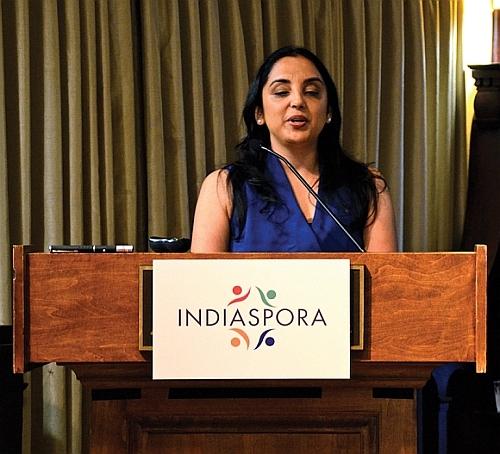 A cross-section of influential Indian American leaders from a diverse set of disciplines and professions have come together under the banner of a new organisation called Indiaspora to energise the community towards collective action. The group of nearly 100 of these leaders -- comprising the likes of multimillionaire entrepreneurs-turned-philanthropists Romesh Wadhwani and Gururaj 'Desh' Deshpande to Neera Tanden, the first Indian-American to head up a Washington, DC think tank, academic Sheena Iyengar to digital guru and Columbia University Professor Sree Sreenivasan -- has the potential to have the kind of clout and create the kind of impact in mainstream American society unmatched by any Indian American organisation, whether political, cultural or philanthropic. 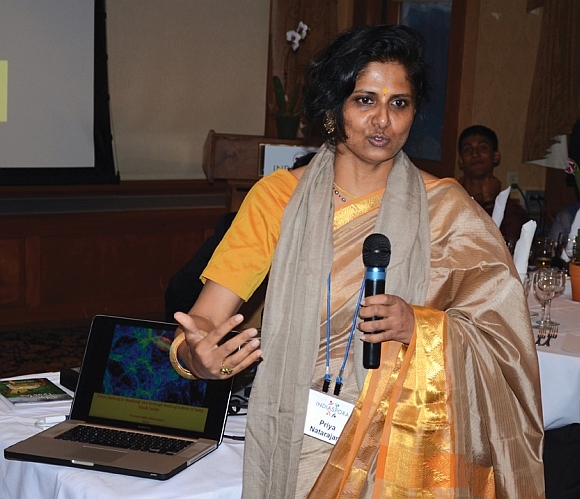 The inaugural brainstorming Indiaspora Forum was held recently at the Mohonk Mountain House in New York's Hudson River Valley over a three-day weekend, which was described by several of the participants and advisers as reminiscent of the Renaissance Weekends that former President Bill Clinton conceived of, where in an informal retreat setting, leaders from a variety of fields of endeavor would foster an exchange of ideas, news and visions. Indiaspora is the brainchild of M R Rangaswami, a 30-year Silicon Valley veteran, who has worked in companies like Oracle and Baan, became an angel investor in 1996, and has invested in over 40 companies. According to his Silicon Valley peers, Chennai-born MR, as he is to those who know him, thrives on creating influential communities that achieve global impact. Using his skills as a critic, cheerleader and facilitator, Rangaswami has over the years united leaders and advanced strategic initiatives in the fields of software, corporate sustainability and entrepreneurship. He also founded the Corporate Eco Forum for large global companies to share best practices and innovations pertaining to sustainability, was co-host of the Nasscom Product Conclave in Bangalore that attracts 1,5,000 tech executives from across India, and created the SHG Foundation to give back to women's and children's organisations worldwide. 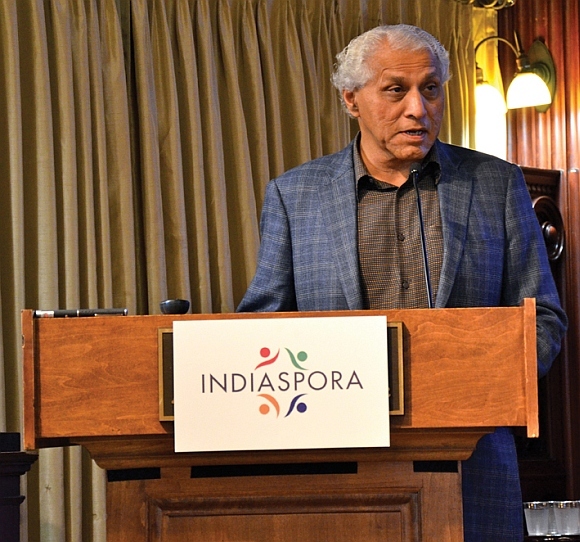 Asked what prompted him to launch Indiaspora and what was new about it vis-a-vis the scores of other Indian American organisations, Rangaswami told India Abroad, "Indian Americans are now 3 million strong and 1 per cent of the United States population. We are successful in many different professions and have organised numerous organisations. Indiaspora is a catalyst to transform the success of Indian Americans into meaningful impact in India and on the global stage. Indiaspora connects leaders from diverse fields such as academia, arts, business, entertainment, health care, media, philanthropy, politics, science and technology." Indiaspora's areas of action, he added, "Include taking care of underprivileged Indian Americans, creating a strategic partnership between the United States and India, as well as building strong bridges to the homeland." 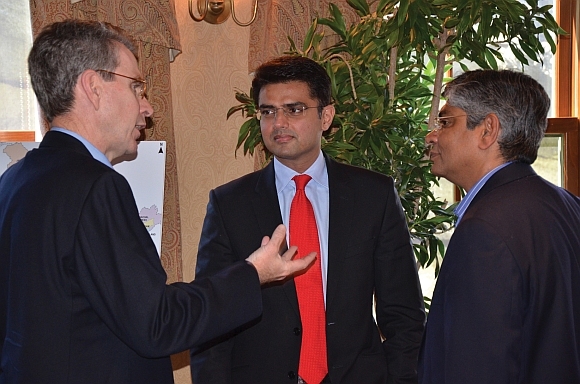 Among the invitees to the inaugural Indiaspora retreat included young Indian lawmakers like Sachin Pilot; longtime strategic gurus like former head of the Confederation of Indian Industry Tarun Das; Ambassador Arun Kunar Singh, deputy chief of mission at the Indian embassy in Washington, DC; Geoff Pyatt, deputy assistant secretary of state for South Asian affairs; and Karl F Inderfurth, former assistant secretary of state for South Asian affairs, the head of the Wadhwani Chair for US-India Policy Studies at the Center for Strategic and International Affairs. Inderfurth serves as an informal adviser to Indiaspora. Asked what the criteria for membership was and how he had gone about picking the people for the retreat, Rangaswami said, "We want to get opinion makers and people who are passionate about the Indian-American community and also interested in giving back to India. We select both well-known leaders as well as 'unusual suspects' who can bring new perspectives to our initiatives. Our Host Committee has also contributed to identifying the right people. We limit it to 100 to keep the quality of discussion and networking at a high level." Indiaspora will host the first-ever Indian-American Inaugural Ball, to celebrate President Barack Obama's re-election, January 19 at the Mandarin Oriental Hotel in Washington, DC. It is expected to attract the who's who of the community from across the country. The ball's Honorary Host Committee comprises US Senator Mark Warner, the Democratic co-chair of the US Senate India Caucus; US Representative Joe Crowley, the Democratic co-chair of the Congressional Caucus on India and Indian Americans; Delaware Governor Jack Markell, chairman, National Governors Association; US Representatives-elect Ami Bera of California and Tulsi Gabbard of Hawaii; and Vinai Thumalapally, the only Indian-American US ambassador, who is the envoy to Belize. Asked about the rationale for the Indiaspora Ball, Rangaswami said, "My inspiration came to me when I was in India visiting with some Indiaspora members and well-wishers. There had always been talk of doing something big but nothing had been done. Following Indiaspora's mission to be action-oriented, I decided to seize the day -- the time was now." "I came back and wrote a large check to book a great venue in DC -- the Mandarin Oriental -- and got my fellow Indiaspora members to join in. And they have (joined in) very strongly. We have a great leadership committee -- Tarun Das, Raj Goyle, Arun Kumar, Shekar Narasimhan, Rajan Navani, Neera Tanden, Jigar Shah and Sonal Shah -- that is helping us and all the members are reaching out to their networks to get the right people to attend." "We would like to both celebrate our success but also to get things done," Rangaswami added. "Post- celebration we want to be a catalyst for supporting Indian American candidates at all levels of American government regardless of party affiliation, and raising the awareness and resources needed to take care of the underprivileged and 'invisibles' in the US community." "Also as a kickstart for President Obama's second-term 'strategic partnership' with India and a strong commitment from our Indian compatriots that reform policies will be carried through. We hope to set up an effective set of philanthropic models that can serve as a bridge between the US and India." Sheel Tyle, considered the youngest Indian-American venture capitalist who is a staunch supporter of Indiaspora, told India Abroad, "MR has done a tremendous job curating Indians and Indian Americans in all domains. TiE, or The Indus Entrepreneurs, has been instrumental in why there are a disproportionate amount of Indian founders who are successful in Silicon Valley. Indiaspora has the potential to do that at a national level and in all fields -- through mentoring, nurturing, and forming a strong bond between the leaders of today and tomorrow." Narasimhan, one of the most influential Democratic Party activists and raiser of funds, told India Abroad, "I went to Mohonk because MR is persuasive, but also partly out of curiosity to see if such a grand idea -- patterned after the Renaissance Weekend where many future Presidents met, like Jimmy Carter and Bill Clinton -- could work in our context. No proof yet, but it was enjoyable and like a good start-up, had enough pluses that it should happen again." "The notion of mixing people from all walks of life and including culture and modernity in an Indian-American context was great, as so many of us are either Indian Americans or IAIs -- Indian-American Indians who also live partly in India, a new and different variable," Narasimhan said. "So if, as President Obama says, the US-India relationship is the 'defining strategic partnership' for the next century -- George W Bush said something quite similar so this may actually be bipartisan -- then who and what is going to help define this partnership?" "Well, MR and others think Indian Americans, and I am adding IAIs, should be in the mix. So, if that is the case, how do we do it? Are there US national, secular, non-linguistic, multi-generational, broad-based influential groups that could do this?" "Or do we need to create one -- but one that that does not get bogged down by leadership issues or narrow ideological struggles?" "Hence the desire to create Indiaspora and keep it deliberately free of organisational politics except for having one driving force -- MR. So, let's see what happens in 2013 and beyond." About the Indiaspora Ball, Narasimhan said, "This is like a coming-out party for Indian Americans. We have had our photo-ops, fielded candidates, built a fundraising system, seen people in positions of influence in the administration, met talking heads and gone to lots and lots of political events. And, now we have had some success at the polls too -- witness Ami Bera. But, we have not been seen as leading." "In order for Indian Americans and IAIs to help lead the conversation on the 'defining strategic partnership', we must be out front and in force and seem cohesive, at least to the outside observer. This is the first of many attempts to do that." 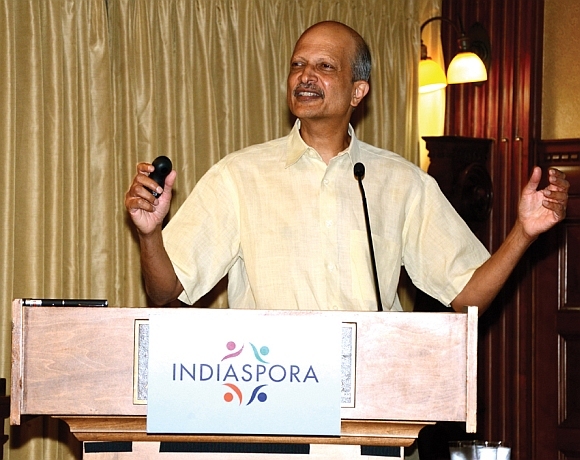 "M R Rangaswami has created something very special with his Indiaspora forum," Inderfurth said. "In many ways it reminds me of the Renaissance weekend retreats... Very informal, very stimulating, very eclectic, and very fun." Unveiled: The spanking new X60R!